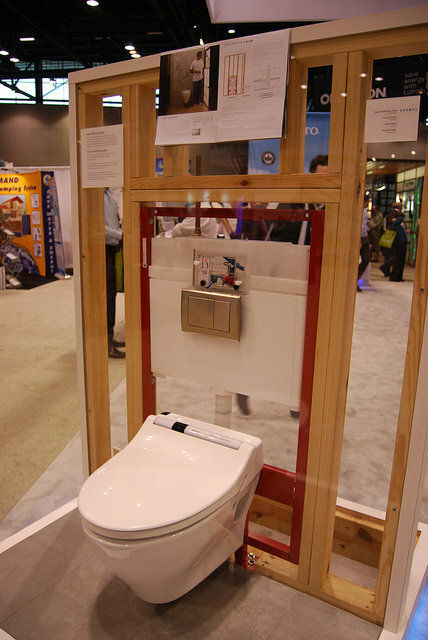 A Toto washlet toilet. Image by Charles and Hudson (Creative Commons License: Attribution-Some Rights Reserved). In our inner page on bathroom fitting, we at Steven Cleary Carpentry urge you to ditch the avocado bathroom suite. In other words, dragging your bathroom into the 21st century. Ever determined to stay ahead of the pack is Japan’s very own Toto. On the 15th May this year, it celebrated its centenary. In their London concept store, Toto began celebrations with a two-day exhibition on the 23 to 25 May during Clerkenwell Design Week. The company was founded in 1917 in Kitakyushu, Japan by Kazuchika Okura. Their best known product is the Washlet toilet. This is a combined lavatory and bidet with a heated seat. Another product of theirs is the Floatation bathtub. Like the Washlet, it combines elegance with function. Water efficiency is another passion of the Toto company: their Washlet outperforms most lavatories in terms of water used on flushing. Innovation doesn’t come cheap; you would be looking a thousands of euros for any of their products. To celebrate their centenary, they have created a micro site with a detailed history of the company. It is quite a good read. Oh, and Jeff Porcaro’s group, famed for Africa, Hold The Line, and Rosanna, did not take their name from the Japanese toilet manufacturer (just to confirm). Steven Cleary Carpentry, 08 June 2017.